New York, c. 1910. In the shape of the Jarmulowsky Bank building. Written “DEPOSIT YOUR MONEY WITH JARMULOWSKY BANKING HOUSE, 165 EAST BROADWAY. WHERE IT IS SAFE. 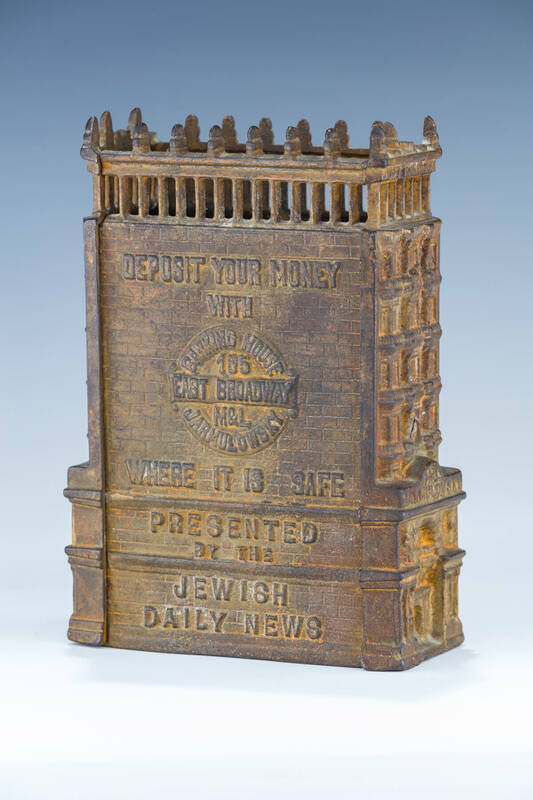 PRESENTED BY THE JEWISH DAILY NEWS.” The Jarmulowsky bank was the choice bank of the Lower East Side Jewish immigrants. It was founded by Sender Jarmulowsky in 1873. It failed during WWI when its depositors withdrew money to send home to Germany. 7” tall.